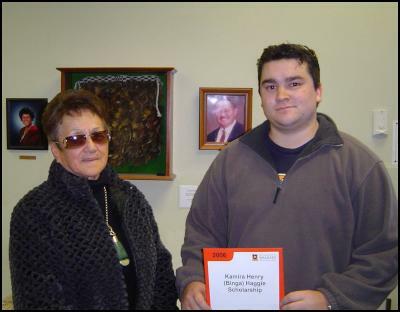 Noki Haggie (left), kuia of Waikato Law School, with law student Cain Kerehoma, the 2006 recipient of the Kamira Henry (Binga) Haggie Scholarship. The $5,000 scholarship is given annually to a Māori law student in honour of Binga Haggie, the Law School’s foundation kaumatua and Noki’s husband, who died in 1997. A 23-year-old Waikato University Law School student has won a $5,000 scholarship for his dedication to his academic career and his contributions to the Law School’s Māori community. Cain Kerehoma is this year’s recipient of the Kamira Henry (Binga) Haggie Scholarship. The scholarship is awarded annually to the most deserving, all-round Māori student studying at the masters level in the Law School. Kerehoma, who is originally from Levin, belongs to Ngāti Raukawa. Kerehoma also is an intellectually gifted student, said Craig Coxhead, a Law School Senior Lecturer who supervised Kerehoma’s honours work. The Kamira Henry (Binga) Haggie Scholarship was established in 1999 to recognise Binga’s (as he was commonly known) role as the Law School’s foundation kaumatua. He served in that role from 1991 to 1996, when he retired. He died in 1997. His wife, Noki Haggie, is the kuia for the Law School and serves on the panel that selects the scholarship winner. Kerehoma came to the University of Waikato in 2001. He earned a bachelors degree in law and Māori before going onto his masters study in law. For the last three years, he worked as a Māori Law Mentor, helping his fellow students navigate the personal and academic challenges of their law school papers. Prof Farrar and Noki Haggie presented Kerehoma with his scholarship at a ceremony last month. Kerehoma said he was humbled to receive the Kamira Henry (Binga) Haggie Scholarship. “I am honoured and privileged to be associated with it,” he said. Kerehoma moved to Wellington in August to take a job with the Ministry of Education. He has two papers left to complete his Masters in Law degree.